“I’ve always been fascinated by storytelling,” says 24-year-old ceramic artist Lena Peters. “My day job is actually in a book shop.” Born to Dutch parents and raised in Sheffield, UK, Peters found the surrounding craggy moors and verdant hills of the Peak District and its mythology—far less canonized than Greek or Roman—uniquely romantic and compelling. While Peters may still have a day job, she made a grand art world entrée a few short months after graduating from Central Saint Martins in July 2017. 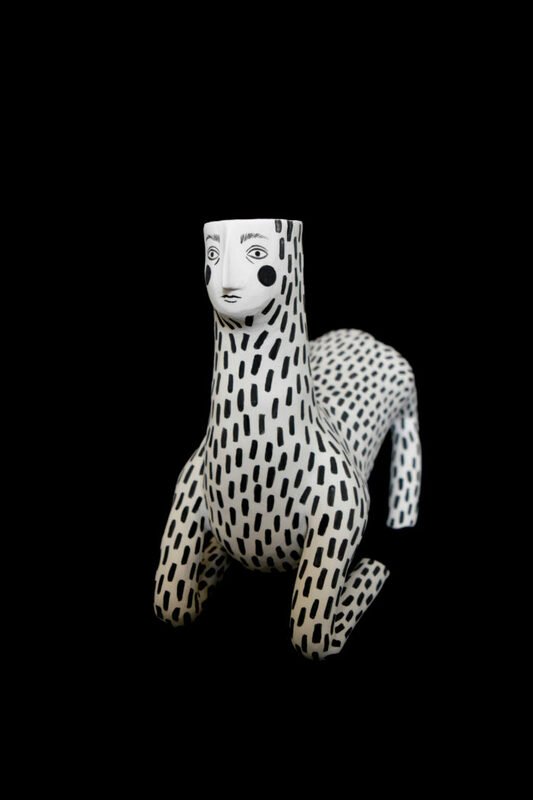 Her final degree project was selected by editor and consultant Gianluca Longo for inclusion in a November 2017 show he curated for David Gill Gallery titled “Vases and Vessels.” Embedded within a series of anthropomorphic female creatures that reincarnate Roman legends mixed with a distinctly pagan quality, Peters’s body of vessels and ceramic objects are a riot of strange charm. A tile installation depicts a female and male Romulus and Remus suckling milk from a vaguely cat-like creature with flowing hair; a handleless amphora is whimsically encircled with a winged creature that recalls an Assyrian griffon with a female face that appears slightly startled. Accompanying the work is “Secrets of the Hidden North,” a text similar to that one might find summarizing an archaeological dig on display at a museum. “The objects,” the text reads, “were discovered in 2015 in the woods of Northumberland National Park, just above Hadrian’s Wall, in the remains of a small settlement.” The statement goes on to posit that they are found objects made by a mingled community of Roman and Celtic Britons, whose iconography fused in this series of ceramic pieces. David Gill calls Peters’s work “beautiful and intensely delicate,” adding that the story fascinates collectors. “Collectors are compelled by the entirely convincing backstory behind each of her pieces and the architectural ‘dig’ that inspires a body of work,” he says of the young artist.